Before you consider bringing a Border Collie into your home, you should read the following information and, if at all possible, meet and talk with people who currently own Border Collies and are familiar with their uniqueness. You should be as well informed about the breed as possible. If you decide to get a puppy, you will need to find a reputable breeder. While it is important that the dog is purebred, you should remember that there are no guarantees just because a dog is registered with any particular organization or association. Registries only provide documentation based on what the breeder tells them. As the consumer, you must be careful. Read the do’s and don’ts below and take time to find a breeder who you feel answers all your questions honestly. Border Collies are unquestionably highly intelligent and active dogs. While the level of intensity varies, those unaccustomed to the breed may consider them too energetic for their lifestyle. Border Collies are the result of hundreds of years of breeding dogs that herd sheep. They love to work and become very bored with inactivity. They will focus on motion and try to stop moving objects (including people and animals) by getting in front of them. They will frequently invent their own games, some of which may be highly annoying for families that are not accustomed to Border Collies. Those wonderful dogs you may have seen working sheep or performing in the movies are the result of many years of training, and you should expect an untrained puppy to be just that – untrained! Is A Border Collie For You? If you live in an apartment, have very small children, have a busy lifestyle, have an unfenced yard, are impatient with compulsive behaviors, or want a Border Collie only because you saw one in the movies, then please consider another breed. Many unhappy situations have resulted when unaware apartment owners purchased a Border Collie puppy and left it in the kitchen all day while at work. It is unwise to leave a Border Collie to its own devices. Leaving a high-energy dog in a crate all day is not a particularly good idea either. Border Collies need a job. The type of job can be as simple as chasing a tennis ball or as sophisticated as herding, agility or obedience training. You should be able to spend some time each day working your dog. Training a Border Collie to be a good citizen in your home is a must. 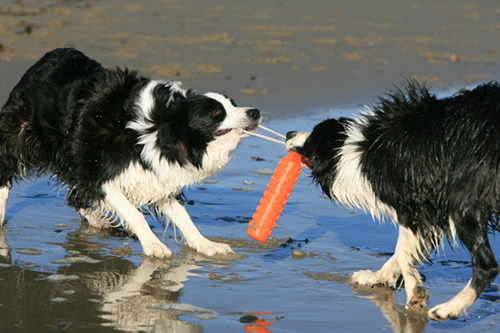 Border Collies are an intensely active breed especially when young. They need space to run and explore. Their strong herding instinct leads them to chase cars, bicycles, and children. It is not unusual for them to inadvertently knock young children over or cause a child riding a bicycle to crash. Out of frustration, Border Collies may even nip running children. While you might not mind, you are liable if your neighbor does. As you might imagine, a fenced yard is a necessity to prevent dogs from getting into other mischief or from running into roadways and possibly being killed. Border Collies often seem a little crazy. Long-time Border Collie owners love the weird things Border Collies do. You often hear them telling stories about their dogs spending hours staring at the cat in hopes that she will move or knocking over lamps when she does. Sometimes you hear of a dog who appears to be missing when he is only in the bathroom obsessed with the dripping tap. There are lots of stories about insect-crazy dogs who live to catch bugs knowing full well that if they jump a little higher they will catch the fly on the ceiling. This is the short list. You might not find any of these amusing in your home or might consider them intolerable. However they are common Border Collie behaviors. Border Collies may not be particularly good around other dogs. Their wish to herd other dogs may not be appreciated. More often now than ever before, Border Collies are simply abandoned, taken to local shelters or put up for adoption. Some may have behavioral problems that can be overcome, but most are perfectly wonderful dogs. Often adopting an older dog is preferable since you have a better idea of what the mature dog will look like and have clearer idea of what its temperament might be. If interested, there are many rescue and adoption groups that are very willing to help you find a dog. If you decide that you really would prefer a Border Collie puppy, you will need some information to help you make a wise decision before contacting a reputable breeder from our Border Collie Breeder’s Referral List. 1. Is the puppy from healthy, sound parents? Border Collies are not immune to genetic problems that plague all dogs. Canine hip dysplasia (CHD) and genetic eye diseases are more common than you might imagine. At present, it is recommended that breeding stock be evaluated for these problems prior to being bred. Hips should be examined radiographically and the radiographs evaluated by the Orthopedic Foundation for Animals (OFA). If the hips are normal, OFA will issue a number and a rating (fair, good or excellent). Buying puppies from parents that have not been examined increases the risk of having a dog that will become dysplastic. You should ask for documentation (OFA certificate). Certificates are only issued for dogs after age 2 years so younger dogs obviously will not have a certificate. Border Collies suffer from progressive retinal atrophy (PRA) and Collie eye anomaly (CEA) in addition to other eye diseases. All can appear at any time. Since CEA may appear initially in young puppies, it is a good idea to have the entire litter examined. Dogs that are used for breeding should be examined yearly by an certified veterinary opthamologists and the results submitted to Canine Eye Registry Foundation (CERF). If the eye is normal, a certificate and number will be issued. Finally there is a growing problem with epilepsy and other seizure disorders in Border Collies. Unfortunately, origins of the disease are not always clear, and you will have to rely on the honesty of the breeder as to whether an inheritable problem exists in their line. Ask about allergies, problems with shoulders or elbows, heart problems, and digestive problems. You would also be wise to ask about siblings of the sire and dam and about any puppies they might have produced. The more dogs in a pedigree that are known to be free of problems increases the chances that your puppy will be healthy. By all means you should make an attempt to see the sire and dam. If you have questions, contact your local veterinarian for more information. 2. Have the puppies been wormed and vaccinated? Puppies which have distended round bellies may have internal parasites. Breeders should check their puppies and treat them if necessary. Most veterinarians recommend that puppies be vaccinated to prevent distemper and parvo at least once. In some areas where the incidence of parvo is high, two vaccinations may have been given. 3. Does the puppy appear healthy? You should look for an active puppy. Sometimes after they have just eaten they may be sleepy, but try to arrange a time to visit when they will be awake and playful. At 6-8 weeks, the puppy should move easily on strong legs. Avoid puppies that have debris in their eyes or have eyes with any discharge. You should also avoid puppies who have dirty ears (inside) or ears that smell badly. Check the insides of their lips expecting to see a bright pink color. Paleness may indicate parasites. Evidence of diarrhea in the kennel area may indicate unhealthy puppies. While each of these may be symptoms of a treatable illnesses, they are also a symptoms of a breeder who is not responsible. 4. Does the puppy have a sound temperament? You should look for puppies that are well adjusted and outgoing. Look for wagging tails and a playful attitude. Stay away from puppies that are shy toward humans, fearful of reasonable noises, or aggressively growl and snarl. The parents’ temperament is usually a good indicator of what the puppies temperament will be. 5. Making the deal: Expect to pay a fair price for a well-bred dog. You are paying for the thought, time, expenses, and expertise of a reputable breeder. Remember that the money you invest in a healthy puppy is an investment in 12-15 or more years of a wonderful relationship with your canine companion. Puppies are usually ready to leave the breeder around 7-8 weeks of age. They should have been completely weaned by then and eating solid food. You should have chosen a place in your home to keep the puppy and made plans to acclimate the new puppy to his strange new surroundings. Ask the breeder for recommendations on feeding. Although opinions vary, a good, well-balanced puppy food is adequate. High protein foods which promote fast growth may not be a good idea and possibly contribute to development of structural problems. The breeder should also provide you with a vaccination history. Contact your veterinarian, make an appointment to have the new puppy examined, and arrange a continuation of his vaccination schedule. Some breeders will also provide you with written guarantees promising to either take the puppy back or refund part or all of the purchase price should the puppy develop specified health problems (CHD for example). Now that you have this monster, where do you go for help and training? Get involved with some training activity. Your best source for information is local Border Collie owners. You can find these folks at obedience training schools, herding clubs, and stock dog trials. In addition, your veterinarian may have names of folks who offer help with training. If you have access to the Internet, search for ‘Border Collies’ to locate a variety of pages with Border Collie-specific information. Learn all that you can about Border Collies before you make a decision that should be for the dog’s lifetime. Consider adopting a homeless Border Collie. Carefully investigate the breeder. Ask for references. Talk to other Border Collie owners and meet their dogs. Never buy a puppy on a whim or buy a puppy as a surprise gift for someone else. Never buy a puppy from a pet store. Reputable breeders would never sell their puppies to a pet store. More than likely puppies in the pet store window are from puppy mill operators and likely to be poorly bred and unhealthy. Never take a puppy because it is available. You may find that you will have to wait 6 months or more until the right puppy is born. Never take a puppy unless you are committed to spending time training it. So, You Think You’re Ready for a Puppy or Dog?